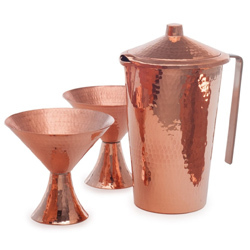 Festive and elegant, these martini glasses are fashioned from recycled copper scrap. A perfect way to celebrate the New Year...or any special occasion. 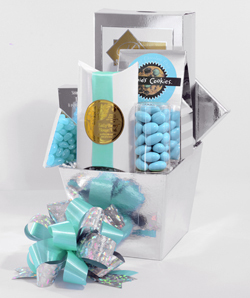 This glistening silver box holds French almonds, chocolate mint chip cookies, jelly beans, chocolate truffles, raspberry shortbread cookie straws and caramel corn drizzled with semisweet chocolate & almonds. Every holiday season we design and create fabulous gift baskets containing candies, cookies, snack mixes, nuts, chocolates and more. Each is created to meet your requested budget. Baskets shown are examples of what we can do. 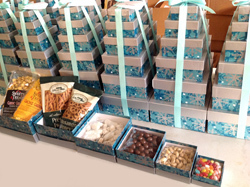 We can create 3-, 5-, and 6-tiered stacks of goodies for your lucky gift recipient. Included is a mixture of sweet & salty, candies, cookies and snacks. Your budget with determine what can be included. 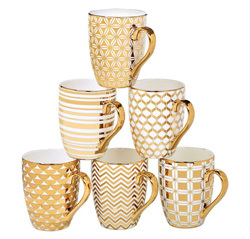 Glittering and gorgeous, this Set of 6 tapered Ceramic Mugs are of assorted designs as shown. These 16-oz. mugs are available in either gold or silver on white. Guaranteed to dress up any home or office setting. Matching dessert plates are available at $50.00 for a set of six.